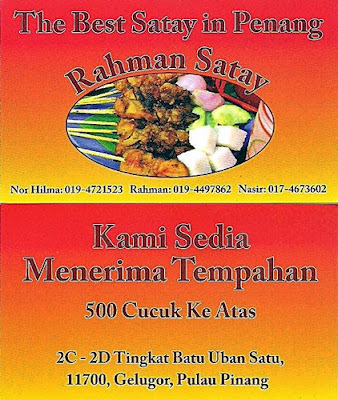 I accidentally stumbled into this Rahman Satay when I was invited to a dinner at 2828 Cafe which is located at the T-junction of Perak Road & Lim Khoon Huat Road by my friend last year (i.e. 2011). My friend ordered a few dishes from one of the popular 'Chu Char' Dishes from Kim Hooi Seafood for our dinner. While we were waiting to be served, my friend ordered a few sticks of satay which were made up of chicken, mutton and beef flavors from the Rahman Satay Stall. We had the Rahman Satays as our starters. 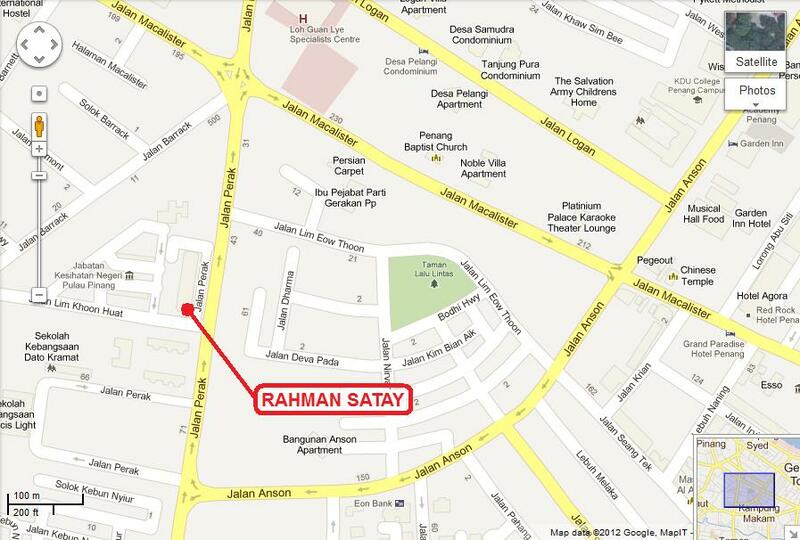 I found that the Rahman Satays were very tasty and delicious. 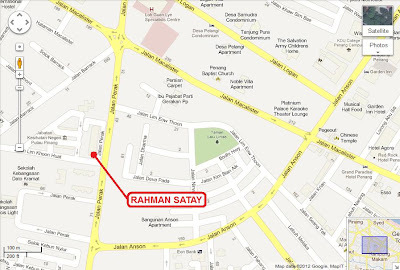 The Rahman Satay Stall is located at the right hand side of the 2828 Cafe along Perak Road. I always patronize the 2828 Cafe during the day time for the Beef Koay Teow Soup (http://eatoutsam.blogspot.com/2010/11/popular-beef-koay-teow-soup-2828-cafe.html). After tasting the yummy Rahman Satay, I craved for it and went there again. This time I was well prepared and armed with a camera to take snaps of the Rahman Satays. No. 01 : General View of 2828 Cafe from the main road of Perak Road, Penang. Rahman Satay also provides catering for all occasions. The order must be more than 500 sticks of any flavor. Wherever you go, you will always find that the satays are accompanied by cut cucumbers and onions. The satays are always served with cut onions and cucumber together with mild spicy roasted peanuts gravy which is everyone's favourite. The satays were well marinated and barqued. I find that the satay still maintained its succulent with slight aroma of lemon grass after it has been barqued. Always loved by Old and Young ones. No. 16 : Chilled Beer is always a good pairing with Satays. If you are beer drinker do not forget to pair the satays with your favorite beer. Cheeeeers !!!! Satay has always been my all-time favourite Nom. Yum!! Sam I noticed the satays are mostly badly burnt. Is it supposed to be like that?